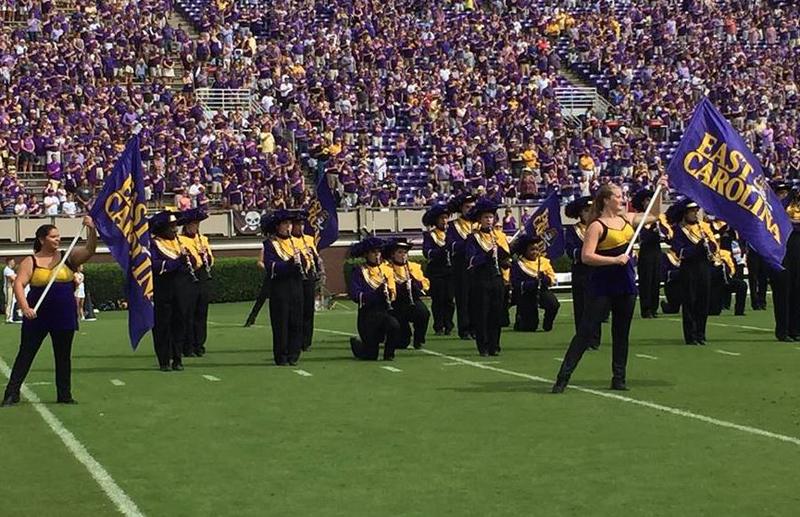 This past Saturday the East Carolina University Marching Pirates had 19 members take a knee to protest the national anthem before their game against UCF. The university quickly went into crisis mode as word and pictures spread across the country about the protest. Cecil Staton, the Chancellor of ECU, issued this supportive statement, backing the band, “While we acknowledge and understand the disappointment felt by many Pirate fans in response to the events at the beginning of today’s football game, we urge all Pirate students, supporters and participants to act with respect for each other’s views. Civil discourse is an East Carolina value and part of our ECU creed. We are proud that recent campus conversations on difficult issues have been constructive, meaningful exchanges that helped grow new understanding among our campus community. East Carolina will safeguard the right to free speech, petition and peaceful assembly as assured by the U.S.
As the band took the field for halftime, ECU fans took to their feet to boo the band and show their disapproval of the protest. As the band left the field and returned to their seats members reported being harassed by fans and even had items from the stands thrown at them. "We regret the actions taken by 19 members of the East Carolina University Marching Pirates on game day October 1st felt hurtful to many in our Pirate family and disrespectful to our country. We understand and respect this is an issue where emotions are strong. The Marching Pirates continue to be fully supportive of all the values the East Carolina University community holds dear." "We have met with the band and the members have collectively reaffirmed their commitment to the unique privilege and responsibility that comes with wearing the uniform of the Marching Pirates. College is about learning, and it is our expectation that the members of the Marching Pirates will learn from this experience and fulfill their responsibilities. While we affirm the right of all our students to express their opinions, protests of this nature by the Marching Pirates will not be tolerated moving forward." "It is our hope that together we can move past these events and that the Marching Pirates will be part of the healing process, working as one Pirate Nation." The statement surprised many band members whom we spoke to after ensuring anonymity. One Marching Pirate member told us that he feels that "the Directors were pressured by the university to make the statement and that he was shocked that they would claim that those who protested don't support the values of the university considering universities are built on the values of free speech." Another member told us that she supports the members who protested and is afraid of what could happen at the next home game now that the university has pulled their support of the protest; "when you live in such a conservative area like where ECU is, you know there will be certain people who will react negatively to something like this, but to watch the school support us and then desert us like this makes us all wonder if they really care about the students at all especially our Directors in the band," she told us. "Everything has changed now and I'm worried about what the fans might do at our next game." ECU's next home game is a nationally televised game on October 13th against Navy in the evening.